Flying into Ulaanbaatar is akin to landing in a green ocean with the waves of the steppe greeting your gaze from the window of the plane. The buildings, Russian cinder block, modern glass skyscrapers, and even the gers (yurts) that snuggle right up to the concrete, all vie to announce the arrival of the capital and the country into the 21st century. Thankfully, the country has not quite arrived in this new decade which allows the traveler to see a staggeringly unspoiled and remarkable landscape. Allowing for lots of driving along bumpy “roads”, the delight of seeing the steppe stretch to the horizon at every turn and the subsequent thrill of coming upon a monastery such as Amarbyasgalant tucked behind the next rise is worth every moment of jostling. 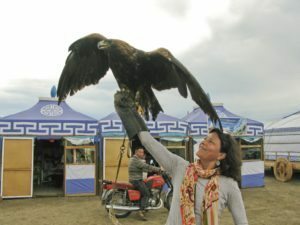 Hearing your first strains of Khoomei, or throat singing, a form of overtone singing and an integral component of the Mongolian culture, silences your mind, tethering you to the moment. Don’t miss striding in the footsteps of Genghis Khan through the remains of Karakoram, legendary 13th century capital of his empire, and Erdene Zuu Monastery, built on this site – an experience to inspire awe in even the most hardened traveler. Wed to their land then and now, the Mongolians are a triumphant, hospitable, and long-lived people. At least one trip to their land is a must in a true explorer’s lifetime.